While I was visiting Washington last month, I finally got the chance to stop by Sound Brewery and try their beers. They are located just a couple miles down the road from where I grew up, and over the past year, I kept hearing about this brewery. Friends still living in the state would tell me about Sound, I’d see websites announce Sound as one of the best breweries of the Pacific Northwest, and I even started to see their beers for sale on Letspour. Needless to say, I had some high expectations, and was anxiously awaiting my chance to taste their beers. I scheduled an interview with one of Sound’s founders, Mark Hood, so I could learn a bit more about what has made Sound so successful, and to taste a few of their beers, of course. The beers were amazing, and my interview with Mark was incredibly insightful. He shared about some of the unique challenges that arise when starting as a homebrewer and opening up your own brewery. Below are my tasting notes for the six beers I tried, and the complete interview with Mark Hood. American Pale Ale: A very smooth, crisp, and refreshing beer. A lot of citrus character up front in the aroma and in the hoppy bitterness, with a grassy finish. Dubbel Entendre: This beer has all the great qualities of a great dubbel style beer. Sweet raison and plum fruitiness that dries out in the finish. There’s a good amount of lingering heat from the alcohol to make this a perfect beer for a cold winter. Monk’s Indiscretion: This is the crown jewel. This beer is layered with flavors, and yet remains superbly balanced and refreshing. It is essentially a Belgian tripel married with an American IPA, but in a way that I haven’t tasted before. Huge citrusy hop aroma in the front end and lots of Belgian esters in the finish. This beer is extremely bright and fruity and dangerously drinkable for 10% alcohol. O’Reagan’s Revenge: Irish red ale with some earthy hop aromas and bready, nutty malts. 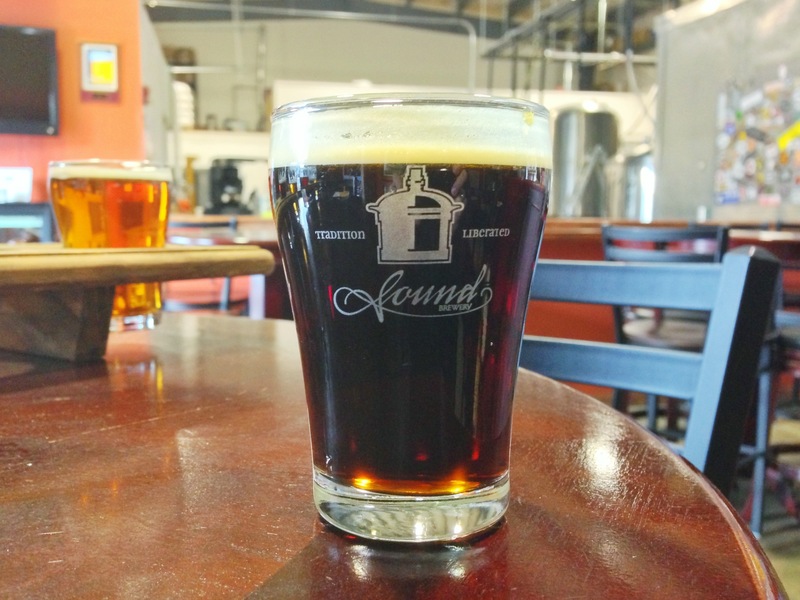 Poundage Porter: Very easy drinking and refreshing. Has some coffee like bitterness in the finish; probably why I enjoyed it so much. Hooked on Hops: How long has Sound Brewery been open for? Mark Hood: Just over two years. HOH: You and Brad Ginn were both homebrewers, correct? MH: Yeah and Alan, another one of our partners, was a home brewer too. Brad and I were in the West Sound Brewers and we were both brewing a lot! We were brewing almost every week for a couple years. We both had been brewing for like twenty years before that, but the last couple years before we opened the brewery we started brewing a lot. And one day, after a particularly rough day at work, I was surfing the web and I saw a brewery for sale down in Woodland Hills, California. And I knew of the system, it’s was a Specific Mechanical system, and I knew the price was really, really good. So I called up Alan and, between the two of us, we sort of talked each other into doing it. So I just got on a plane, that day actually, and flew down to Woodland Hills and checked out the system at a BJ’s Restaurant there. They were selling that system and a few tanks. I gave them a check and had them sign something, and picked it up three or four months later. I got a fifty-three foot flatbed and brought it up. At that point, I didn’t have any partners, just knew that Alan was going to be involved. I didn’t know where we were going to put it, I didn’t even know if I could afford to do it, but we had the equipment at that point so we sort of had to do it! I still worked the day job for the first year and a half and just doing this in the afternoons, getting things going. Then I talked Brad into leaving his job so he could be the head brewer and do all the day to day brewing. HOH: I was going to ask why you guys decided to open a brewery but it sounds like you just saw a brewhouse for a good price and decided to buy it and find a way to make it work? MH: Yeah that’s really it! But I think every homebrewer dreams of doing that someday. And honestly, what made me want to do it was that I had brewed Monk’s Indiscretion at home, and I had gotten some pretty good reviews on it, everyone was going crazy over it because it’s so different and unique. And I just thought, “man, Monk’s Indiscretion, we could sell that anywhere in Seattle, because it’s hoppy, balanced, Belgian, and strong.” That was sort of the one that made me decided to do it. Brad had just won the National Homebrewing Competition gold medal with Tripel Entendre. So we knew we were going to do the Tripel, we knew we were going to do Monk’s, and I used to play around with a double IPA recipe that I called ‘Indiscretion.’ So there was Monk’s Indiscretion, and the regular American version was called Indiscretion. That one became Humulo Nimbus, because the names were too confusing. I had been brewing an Irish red for my neighbor John, who is also a partner, for his St Patrick’s day party for like 5 years in a row, so we knew we were going to do that too. O’Reagan is his mother’s maiden name, so that’s why it’s named O’Reagan’s Revenge. And then we added the Dubbel Entendre, and just kept adding them from there. Poundage Porter won the silver medal at the World Beer Cup last year at the Craft Brewer’s Conference in San Diego. HOH: And you guys have won several other awards too for your beers, right? MH: Yeah, I think we’ve won 12 different NABA awards. We’ve also won several US Open Beer awards, Monk’s Indiscretion won first place in the “anything goes” category. Humulo Nimbus won first place last year in the double IPA category. That’s nation wide for double IPA! Dubbel Entendre won best Belgian abbey. So, Dubbel and Tripel have both won awards now. HOH: What is it like getting all these awards but only being open for two years? MH: Well it’s fun! We were used to doing that before in the home brewing circles. Three different years I’ve placed in the top three in the National Organic Home Brewing Challenge in San Francisco, and Brad had been winning in the National Homebrewing Conference. We kinda knew that we had different takes on beers, and Brad is sort of meticulous and does a great job making sure that they are perfect every time. We are slowing down though on the number of entries we’re putting in now, because it takes a lot of time and energy to enter them all. And it get’s expensive shipping bottles all across the country. Plus, in beer competitions you could get wiped out right in the first round because they go “oh that’s not a tripel.” But what I always say is that, if you do win an award, there’s a really good chance that it’s a really good beer. But there’s also a lot of really good beers that don’t get awards, because they get knocked out in the first few rounds, and they shouldn’t get knocked out. HOH: How big is the brewhouse that you bought from BJ’s? MH: Technically it’s a ten hectoliter system, which is about eight and a half barrels. But we use it as a seven barrel system. When we say seven barrels in America, that usually means you knock out 7 barrels into the tank. Then by the time you are done, you’re gonna end up with about six from losses. We actually end up with seven barrels of finished product, even with the strong beers. HOH: Would you consider yourself a nano brewery? MH: No. Nano is typically less than three barrels. We’re a micro. The definition I’ve always heard is that nano’s are three barrels and under. HOH: Relatively speaking, you guys are still a pretty small brewery though. MH: Oh yeah, really small! HOH: What are some of the difficulties of being such a small brewery? MH: The biggest difficulty is that you kind of have to self distribute at our size. So it’s a lot of driving around and you don’t get the efficiencies of scale, because everybody wants to get one keg and they are twenty miles away, and then there’s one case to a grocery store. So distribution is very difficult. Now, if you go through a distributor at our size, they wouldn’t do anything for us. We are already selling all the beer we can make right now. They wouldn’t increase our sales, unless we increase our capacity by getting a new system. So all they would do is take thirty percent away from us and we’d still sell the same amount of beer we’re selling now, but get thirty percent less. HOH: Washington lets you self distribute? MH: Yes, it’s awesome. Washington is awesome with licenses. We have one license, and it allows us to have a tasting room, it allows us to sell retail packages out of here, and we can sell wholesale, all with one license. Most states, that’s three or four licenses, and you’d have to pay for each one of them. Washington is really progressive in that sense. HOH: What are some great things about being a small brewery? MH: It’s a beer culture here in Washington. Craft breweries have about 10% of the market here, which is higher than the national average. People are a little bit more progressive about beer styles here than the other northwest states, but even still, it’s an IPA state, mostly I think because we grow hops here. IPA’s and double IPA’s, you don’t even have to sell. Doesn’t even matter how much you make; you won’t make enough, they will sell themselves. All the other beers that we do, like the Belgians, you actually have to sell those. Some people here don’t really understand Belgians yet. The nice thing here too, well it’s good and bad, but there are so many festivals here in Washington! You could be doing a festival every single weekend; but it’s good publicity. HOH: Do you distribute out of state? MH: Yeah, right now we send 48 kegs a month to Tokyo, and it goes to Yokohama and Osaka also. It started out as just a pub. A guy wanted to import them over there. I started connecting with him over email and it turns out now he’s a good friend and he started a distributor over there. So he actually sends us disposable pub kegs, that he pays for, we fill them up with beer, and I take them over to Kent, Washington. Then it goes on a boat and he sees them about three weeks later. It’s called Devil Craft, it’s a great place! He’s also Evergreen Imports. Also, we use a distributor in eastern Washington and they do Idaho as well. April we will be in the four western provinces of Canada with bottles. HOH: How did you guys get involved with Letspour? MH: They got a hold of us, and they are awesome! If you look at our Rate Beer and Beer Advocate ratings, usually eight out of ten of the reviews will not be from Washington, they are from all over the country, or all over the world even. There’s reviews from people in Denmark on there! Letspour is getting beer all over the place! I don’t know how they do it on the price though, their prices are really good, considering they ship beer all around the world. Letspour actually called into the brewery one day, then came in and tasted some beers. Now I send them anywhere from 5-10 cases a week. They do a good job, and they package really well too! And there’s also Marina Market that also sells our beer all over the world too. HOH: It seems that most of your beers are Belgian influenced, to some degree. MH: Yeah about 50%, by revenue anyway. About 5 of our bottled beers use Belgian yeast. HOH: What is it about Belgian yeast that you guys like? MH: When we started, we decided that we didn’t want to hit the middle of the bell shaped curve, but instead to hit the edges of the curve, and show Washington that there’s a lot of killer beer styles out there besides IPAs. This state really is IPA crazy! But it’s not just Belgians, our summer seasonal is a kristallweizen, which a lot of people don’t know about. It’s a real Bavarian-style hefeweizen, but crystal clear. We do a weizenbock in the fall, another German style. We do O’Reagan’s Revenge, which is Irish. Poundage Porter also uses an Irish yeast, but it’s a London style porter. It’s not American at all, like Black Butte, which is a robust porter. This is a London porter, or as the BJCP calls it, a brown porter. We all like Belgian styles here, but we also like German styles, and we are thinking about doing some more English styles pretty soon. Tradition Liberated: We like doing traditional styles, but with our own spin. HOH: What are some next steps for Sound Brewery? MH: Bigger brewery! We’ve got to get a bigger brewery. Right now we’re are production limited. I would also love to go through a distributor. I would like to be able to sit back and actually cut deals with people to get big quantities, instead of driving around everyday, dropping off kegs and cases everywhere. It’s getting to the point where I’m doing that three days a week, and it’s hard to run the business when you’re driving around all the time. So we need to get a bigger brewery, and I’m actually looking at some new systems right now and pricing something out. We also want to open another tasting room. In Washington state, not only are you allowed to have a tasting room with the same license, you are also allowed two other what they call: tied houses. A tied house is a brewery ran bar. Only two though, so you can’t have a whole chain of Sound Brewery bars. So we are going to open two more tasting rooms soon, probably one on this side of the water and one on the Seattle side.